The International Order of the Rainbow for Girls is a youth service organization for girls ages 11-20, founded in 1922. Through fun events girls develop friendships, build their self-esteem and confidence, and learn the skills that will allow them to take on whatever they choose in the future. Girls choose their own projects and charities to support, plan events, and run their Assembly. Juneau's Assembly, founded in 1932, has worked with and fundraised for the AWARE Shelter, Gastineau Humane Society, Boys and Girls Club, Pioneer Home, Southeast Alaska Food Bank, Glory Hole and more locally, statewide and internationally. Our Juneau Rainbow family has gone on to become elected officials, studied abroad, run government projects, and more. Get in touch to see where Rainbow can take you or the young lady in your life! Obtain an application for membership. You can fill out a short contact form at demolay.org to get you started. The application will ask for some basic information about you. You may also visit with a member or Advisor of the Juneau Chapter and obtain an application from them, and ask about some fun events you may attend. It’s helpful to get to know the members and learn more about the organization. The Chapter’s business meetings are normally “members only” but social events may be available for you to attend as a guest. Submit your application. Your application will need to be accompanied by your Life Membership fee. DeMolay does not charge annual dues for membership. Reception into DeMolay. 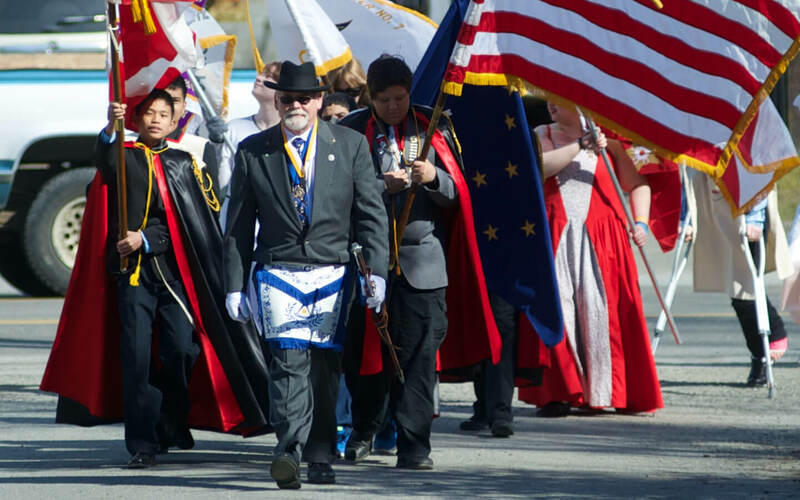 DeMolay maintains many impressive traditions. Among them are the formal ceremonies for receiving new members. Your parents and other adult relatives over 21 years of age will be welcome at all of these ceremonies.